Going for a (long) walk on National Pilgrim Paths Day. St Patrick’s cow, accompanied by her calf, was grazing peacefully on the alluvial flats by the side of the Tar river in the extreme south of Tipperary, when the calf was abducted by a wily cattle-thief from Kilwaltermoy, or somewhere south of the Bride, in the County Waterford. The robber, with his booty, started in haste for his home some eighteen or twenty miles distant, and shortly afterwards, the cow, having discovered her loss, commenced a distracted pursuit. In her fury, as she went, she tore up the earth with her horns – hence the double trench – till she overtook the robber whom she promptly gave his deserts. A number of things come out in this story. First the location of the abduction of the calf – on the very rich alluviall grasslands by the banks of the Tar river. The south of county Tipperary is known as excellent country for raising racehorses – but the same land is equally good for raising cattle, especially dairy cows. Second point: the cattle-thief rings true to the period – the national sport in ancient Ireland wasn’t hurling as the GAA would have us imagine. Rather cattle-raiding was THE sport that everyone aspired to – after all Ireland is the only country that I know of with a cowboy story as its national epic – the Tain Bo Cualigne is all about a war started during a cattle raid. Even the Americans haven’t got a cowboy story as THEIR national epic, despite Hollywood’s best attempts. The third point is that the robber came from the area just south of Lismore, somewhere in the valley of the Bride River – another rich cattle-raising area. But to get there the thief had to cross the Blackwater or Amhainn Mor na Mumhan (the Great River of Munster) and then the Knockmealdown Mountains. It was a clever statagem for the route would throw off any pursuers. Unless, of course, the pursuer happened to be a furious mother cow in search of her stolen calf. The double trench mentioned in the text refers to what Canon Power was able to observe on the ground as he spent years trying to trace the route of the cow’s pursuit of her calf – a double ditch or trench cutting across the landscape of western County Waterford. 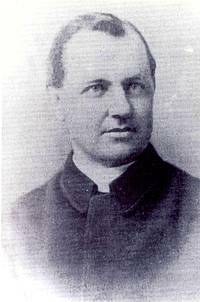 Canon Patrick Power, who traced the route from Ardfinnan to Ardmore via Lismore. What Canon Power did at the end of the nineteenth century was to trace the route of ancient pilgrims from Ardfinnan, on the Suir in south Tipperary, to Lismore, on the Blackwater in Waterford, and then on to Ardmore on the coast. It took him years to do it, and he even managed to trace the alternative route from Lismore towards Kilwatermoy and beyond, almost to Molana Abbey, just north of Youghal. Power was able to supply his own hand-drawn maps to accompany his text and he mentioned all the local people who’d helped him in his quest to fine the route – most unusually for a scholar, but he felt he owed them much and wanted other scholars to consult the same people. The whole walking route is now marked, and even signposted. Interesting how the distance is left off the signs! 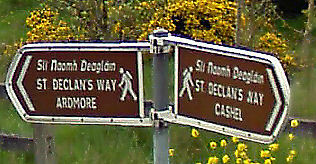 Today the whole route is now identified as a Pilgrim Path, used by people travelling from Cashel to Ardmore or vice versa, and taking in the important monastic site of Lismore. Unfortunately it has taken us a long time to recognize the potential tourism, heritage,recreational and health benefits of these routes. In several cases it is likely that much of the original route cannot be recovered so approximate routes are used to link up the known routes. 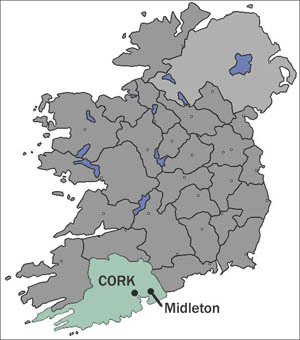 Midleton is located off map some distance below the bottom left. Ardmore is located near the bottom right, also off map. 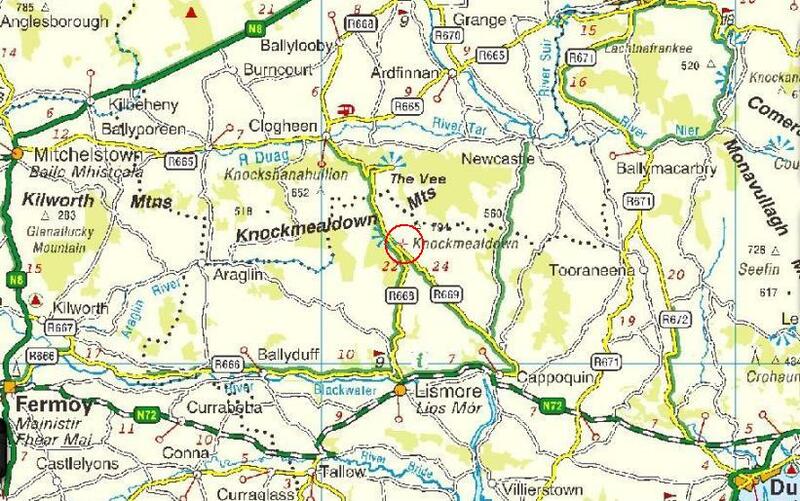 The Knockmealdowns are in the middle, between Lismore on the Blackwater and Ardfinnan on the Suir. 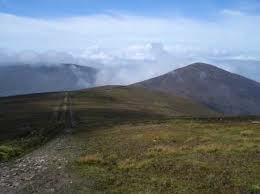 The Knockmealdowns can be covered by cloud because the mountains are at the meeting point of the inland airflows to the north and the sea borne weather to the south. Saturday, 4th April (Holy Saturday or Easter Saturday, as you prefer) is National Pilgrim Paths Day – how appropriate that it happens during Easter! My sister and I are joining walkers to follow part of the Rian bo Padraig. We’re going from Mount Mellary Abbey in County Waterford to Ardfinnan in County Tipperary on St Declan’s Way. The eighteen mile hike will take us over the Knockmealdowns to give us a stunning view northwards over the Golden Vale in south County Tipperary. It should take about four hours – or five for the weary and distracted! Even the heavens are going to join in – the weather forecast looks splendid, with sunshine and warm spring temperatures (very important on top of a mountain range in Ireland!). Mount Mellary Abbey is a Trappist (Cistercian) monastery founded as a refuge for French monks fleeing persecution in France after the July Revolution of 1830. The abbey stands on the southern side of the Knockmealdowns. 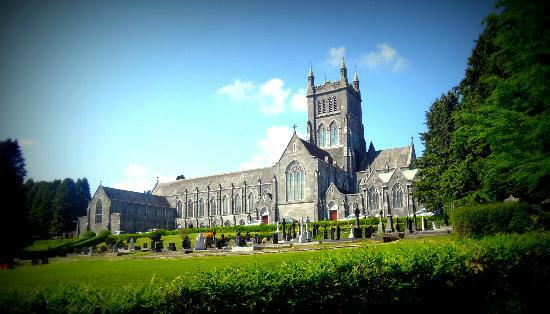 The huge abbey church was built with stone removed from Mitchelstown Castle after it was burned out in 1922. The village of Ardfinnan is presided over by its still inhabited castle. 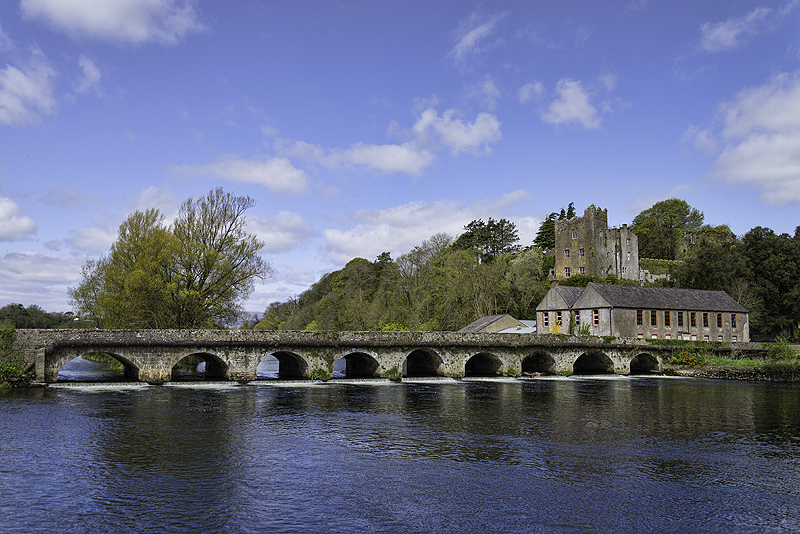 Note the width of the River Suir at teh foot of the castle. One thing I’ve discussed locally is the idea of tracing the original route linking Molana Abbey to Cork by way of Cloyne – some of this route is actually known, but there are serious gaps. But I hope that one day we might be able to link St Finbarr’s Way (from Gougane Barra to Cork with St Declan’s Way and the Rian Bo Padraig via the pilgrim route through Imokilly. Such a route would allow a person to walk from Cashel to Gougane Barra via Lismore and Cloyne! 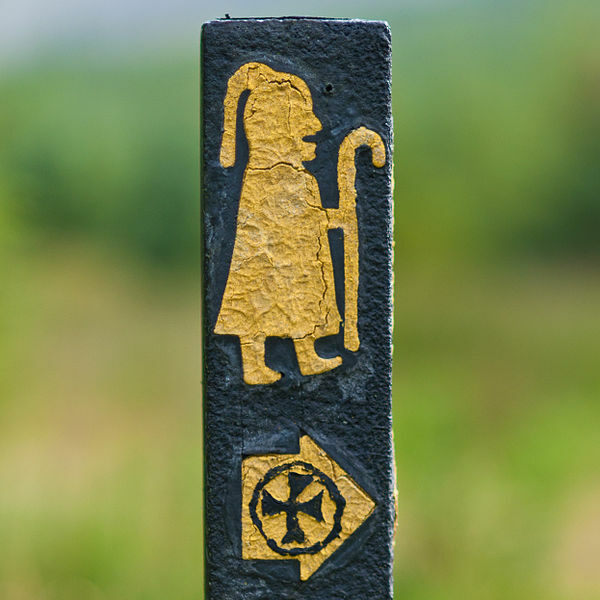 The Camino de Santiago has its identifiable waymarkers. 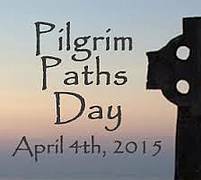 So do the Irish Pilgrim Paths – this shows an ancient Irish monk carrying an early Irish crozier. Note that the monk is wearing a hood, not a pony-tail – it rains in Ireland! The Irish crozier was shorter than the Continental one – and a lot more practical – it was really a walking stick for elderly clerics, or for pilgrims! If there’s no pilgrimage trail near you, just get out and find a nice track in the countryside to follow for a while – it’s good for the soul.